Anneke Caramin: I'm Johnny Two Hats, why do you think they call me that? I'm Johnny Two Hats, why do you think they call me that? 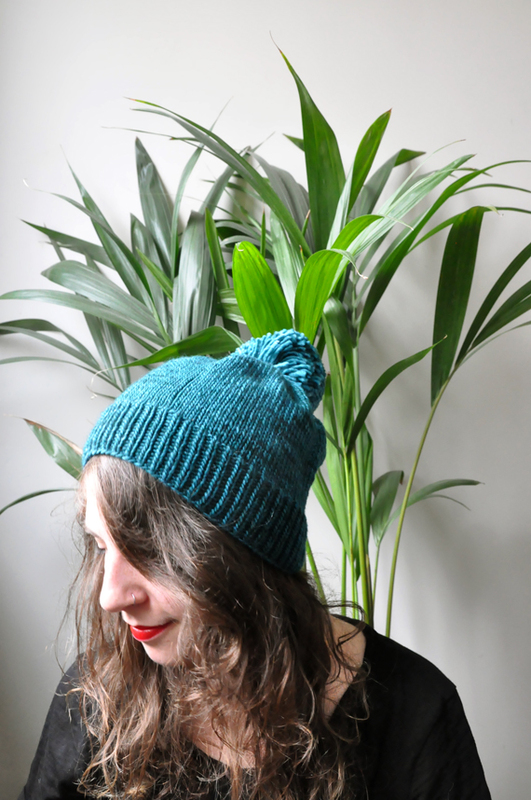 I've been on a bit of a knitting kick lately, and hats are one of my favourite things to knit. They're easy enough to make whilst watching tv, they don't use a lot of yarn so you can splurge on nice stuff and they don't take forever like a scarf or a sweater does. 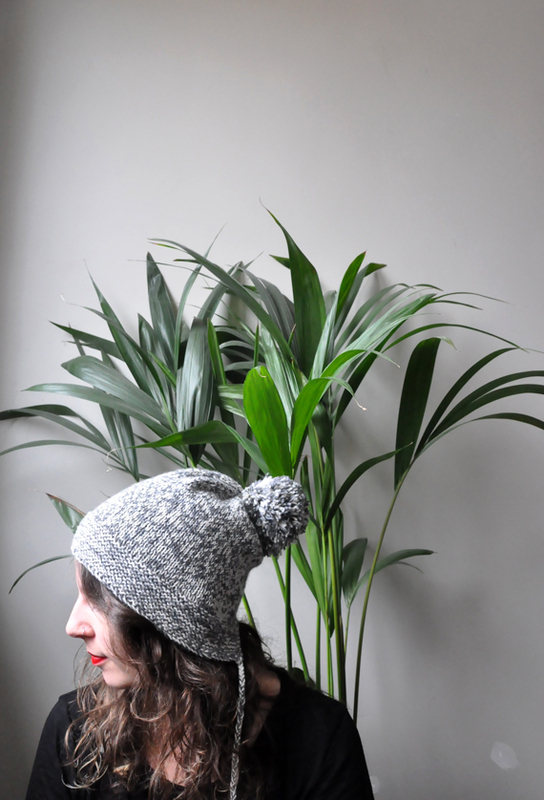 I made a few hats last winter and over the past few weeks, and today I'll show you ALL OF THEM. The first one is one of my favourites. 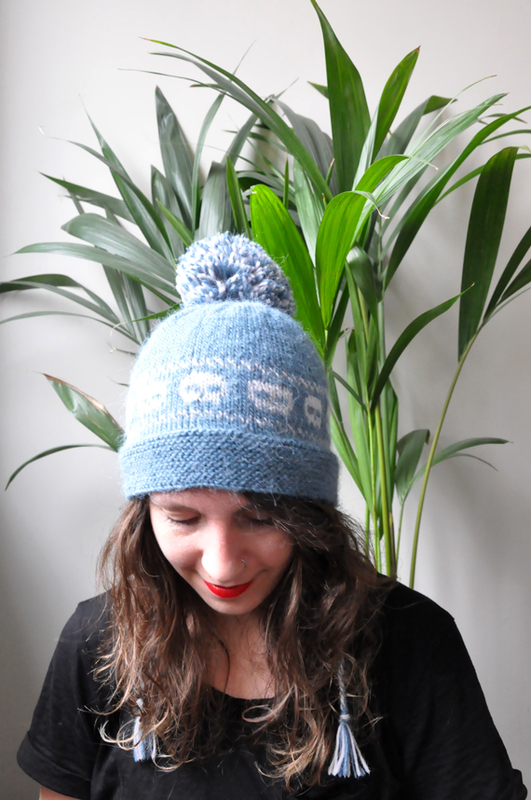 It's the Rooty, a pattern I spotted on Jo's blog before, and it was a bit of love at first sight. 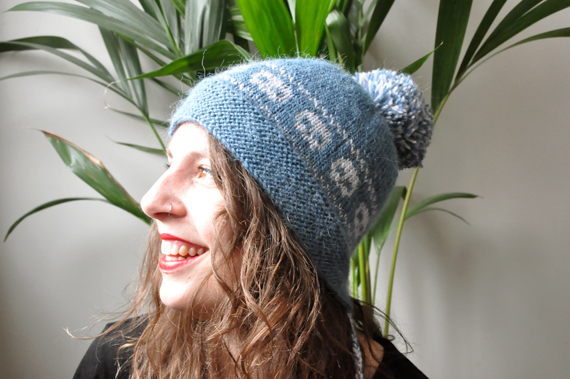 The construction is easy but quite clever: you knit the band first on straight needles and then join it in the round for the body of the hat. This creates a vent in the back so your entire head is covered without any awkward bunching up! The yarn for this isn't super special: two different colours of sock yarn held together. It was on sale at the shop, and combined with my employee discount this made for a super cheap hat that has already gotten tons of wear! Here's another firm favourite! This yarn is a nice and warm alpaca blend, and I sort of made the pattern up as I went with it. If I remember correctly it went a bit like this: knitting a swatch, calculating how many stitches to cast on, knitting ribbing until I got sick of it, deciding this yarn would look cool in a seed stitch, cursing myself for doing what's essentially more knits&purls, finishing the hat as a slouchy beanie, deciding to forego a pom pom for once. I love it. It's burgundy! 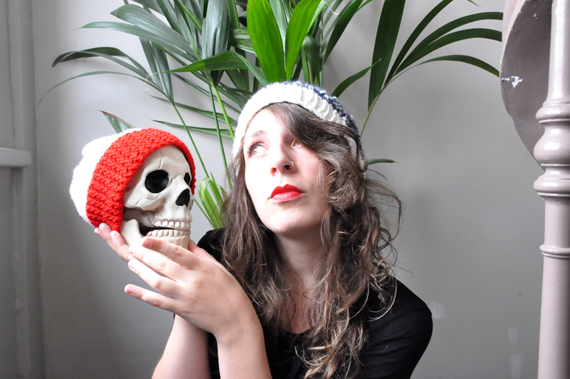 This was a new addition to the hat collection, shown together with my friend Dead Waldo (wearing one of the very first hats I ever knitted. So deep, you guys). I had been eyeballing this yarn for a while now (the main problem with seeing things almost every day...) and went for it in the end. It's pretty interesting: bulky strands of white wool (that go from thick to thin) wrapped in dark blue yarn. I used a plain white bulky yarn for the ribbing since that looked horrendous in the effect yarn (so uneven!) and made a big fluffy pom pom with the leftovers. Toasty! You wouldn't say it, but it's also the perfect hat to be dramatic in. Next up: another Rooty hat! 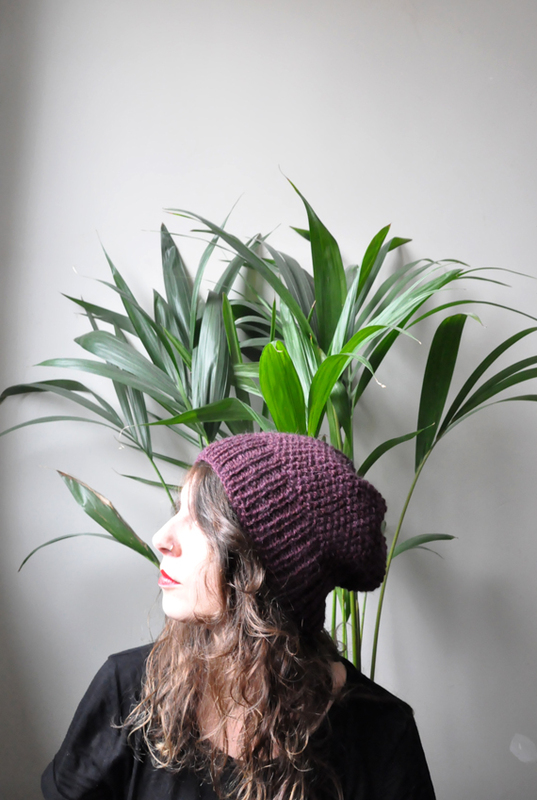 This one is made from a super luxurious alpaca and merino mix, and it took longer than all previous hats combined. Most of this was my fault: I wanted to knit the pattern with smaller needles (since this yarn is finer than what the pattern calls for) and add a stranded pattern around the brim, so I had to work with a certain number of stitches to be able to make a nice repeat. I think I cast this on and ripped it back out three or four times. It worked out in the end though: the end result is a bit more snug than what I'm used to, but it's totally wearable. 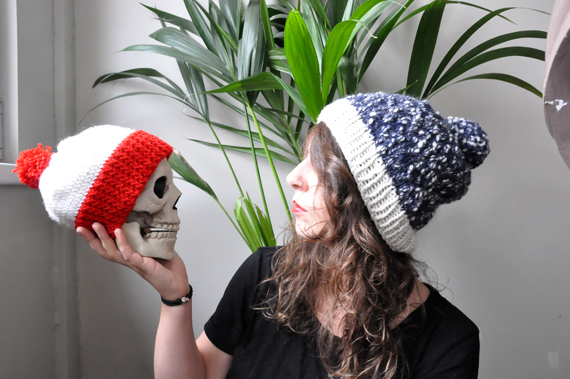 The yarn is amazingly soft, and it has skulls on it. Because I'm really a tough and badass person, yes sir! And finally, a new favourite! I bought 100 grams of this yarn at Julija's shop when Tasia was visiting Belgium, and I LOVE the colour. Seriously, I have an appointment with my hairdresser later this week (back to blue!) and I'm tempted to bring this hat to show the exact colour I want. 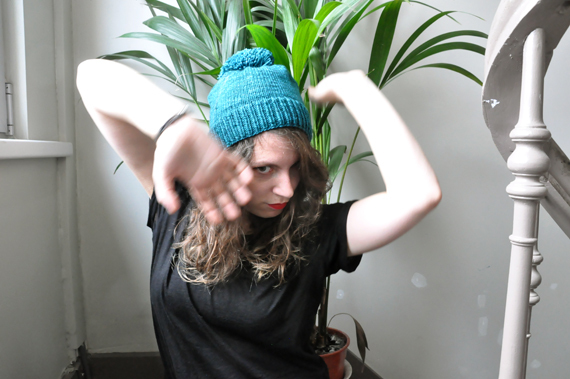 Is it silly to match your hair to your hat? Again, no real pattern here. cast on stitches until I think it will fit my head, try on a few times along the way, make big fluffy pom pom. The yarn is a lovely soft merino, dyed in small batches and OMFG THE COLOUR.